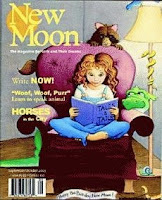 Have you ever taken a look at New Moon Magazine? If you are the mother of daughters, especially age 8 to 12 (and beyond), this is a magazine worth buying, reading and talking about with the girls in your life. I love the focus on empowering girls to see through gender stereotypes, to develop a multi-cultural perspective, and to read about successful girls and women. If you worry about the safety of sites like My Space and Facebook for your pre-teen or teen, this might be a good way to allow your daughter some freedom of expression, in a safe and fun environment. I know I will keep this in mind for my students, and for when my daughters are older (but that is a long way off, maybe social networking in this way will be a thing of the past by then!). Your post was one of the very first things I saw when I got to work today. What a wonderful way to start the day! Positive reviews mean so much to us here at New Moon. We have a Girls Editorial Board meeting coming up in a few days, and it’s always great to share wonderful words like this with the girls who work so hard bringing New Moon to life. And we’re very proud to now have New Moon online to reach even more girls. Thank you for supporting this mission! GMO-Free Cheerios in Europe, Why not in US?